The new painting I bought for the dining room came in early! 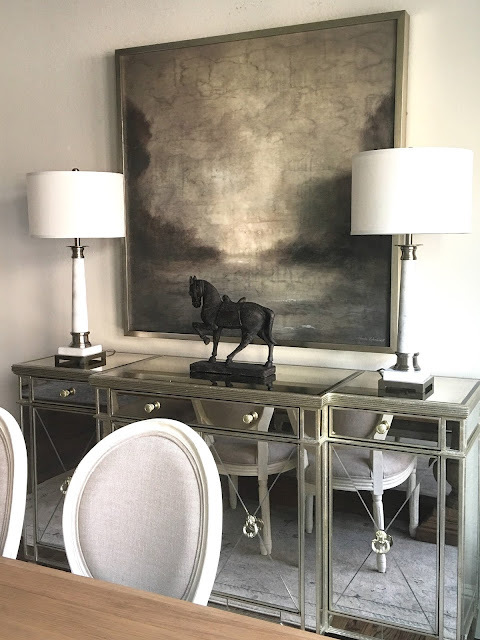 I actually wasn't sure if it was going to go in the dining room because I loved the gold mirror in there, but once I propped it up on the buffet I fell in love with it. The whole room just tied itself together. It grounded the mirrored buffet and the gray went so well with the drapes. I was worried it was a bit too traditional and that I would get bored with it so I had to live with it a couple of weeks. I can safely say it's going to stay because I still love it just as much as I did the day it was delivered. Unfortunately, I had to admit the chandelier from the last post was just too small for this room. Here's a bad picture of it sitting on the table. It's really much prettier in person. This gives you an idea of how it all works together once I buy the correct size. When I try to save money, this is what happens. 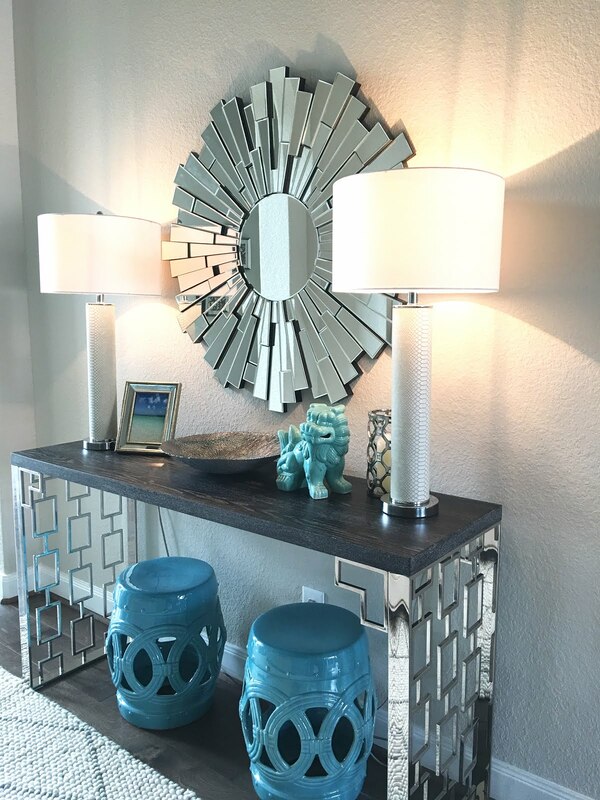 I really did not want to re-pack it and send it back after putting on the crystals on so I decided to put it in the master bedroom along with the gold mirror. I'm going to try and find a similar one that's a bit bigger for the dining room soon. 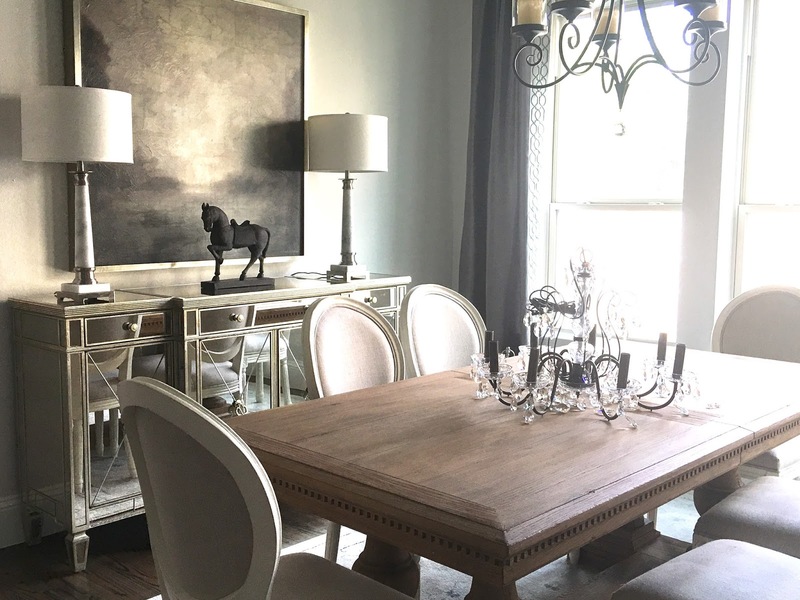 I'll update you on the master bedroom with the dining room cast-offs once my husband adjusts the chandelier. It's leaning to the side a little and it needs to be shortened a bit. At least he cut the cord too long instead of too short! Here is the look I'm hoping for once the room is complete. I'm still not completely sold on the linen chairs at the head of the table since I don't really need them. I was completely sold on the rug until I saw the price. If price is an indicator of good style then I am a master at picking out lighting and rugs because I am always drawn to the most expensive ones. Champagne taste on a beer budget, story of my life! Once I finish the decor I'd love to add trim work and do something with the windows. You can't tell from the picture, but the windows are hideous builder grade ones that are messing up my design. I've considered adding shutters (not my favorite look with this furniture), replacing the windows (probably not going to happen), trim work around the windows for distraction (but then I'd have to do the rest of the house and the windows are still ugly), or sheer drapes (does anyone do that anymore?). The view is very un-lovely of the fence and the side of the neighbor's house. I have a landscaping plan for that and it includes very tall Italian cypress trees. One problem solved! I've been trying to get the backyard ready before summer is here so I haven't had much time to think about chandelier or rug shopping. We've been getting quotes for a couple of outdoor projects and just getting the quotes is a project! I'm hoping to be done with all of that by the time the boys are out of school so I can go back to finishing up the dining room. By then, it will be too hot to do anything outside so I'll want an indoor project. I'm spending as much time as I can outside right now with this great spring weather. Have a great weekend! Love it, all of it! So stunning, time for dinner parties!